Along a damp ditch, bristly green bottle-brushes grow to my knees. This is giant horsetail, or Equisetum telmateia. Some call it a weed, but horsetail is one of my all-time favorite plants. They form low thickets of supple green stalks with long, skinny stick-like leaves that sprout out in all directions. When I was a kid I’d pick my teacher bouquets of them on my way to school—my quirky version of the proverbial apple. As an adult I learned there are even more reasons to love horsetails than their good looks. The Equisetum species are considered “living fossils”, which means that they have changed very little over the last hundred million years or so (though they have shrunk some; back then they grew as tall as trees!). Grab a handful of horsetail plants next time you walk past a patch. It scrunches pleasantly in your palm, but the slim stalk and leaves tend to bend, not break. They are jam-packed with silica, which makes them strong as well as flexible. This earned the plant the alternate name of scouringrush–it’s been used to scrub dirty dishes, to polish metal, to clean floors, and even as sandpaper. Some herbalists recommend drinking a tea made from the dried young stalks for strong and supple hair, skin and bones. Watch out, as large amounts of the raw plant can be harmful or toxic. The bottle-brush part of the plant that you usually see is sterile, but in the spring giant horsetail sprouts a fertile stalk that is leafless and topped by a pale cone-like structure that releases spores. It also spreads by rhizome, which may be why some call it a weed—it can be dense and hard to get rid of since new plants sprout up from the roots. 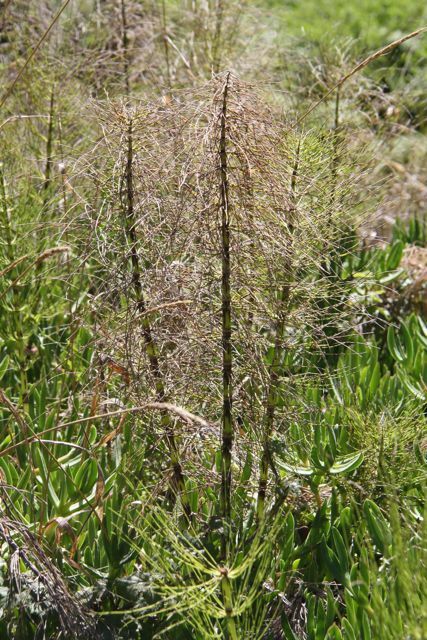 There are four species of Equisetum in the SF bay area, but only two of the brushy type. Giant horsetail is probably more common in these parts, though its bushy cousin Equisetum arvense snagged the official nickname of “common horsetail”. You can identify giant horsetail because its stem is larger–generally greater than 5mm across–and if you look close at its twiggy leaves, you’ll see that each is ribbed with several grooved ridges. The grooves also are a way to identify it, though the giant-ness is easier.